The Lake Norman and Cornelius, NC area lends itself to a wide range of lifestyles—lifestyles centered on lake activities, or on golf; lifestyles devoted to tennis, to boating, or simply to the perks of small-town Americana. To enjoy the benefits of this area, though, you first need to find a home to call your own, in a neighborhood that promotes your lifestyle goals. 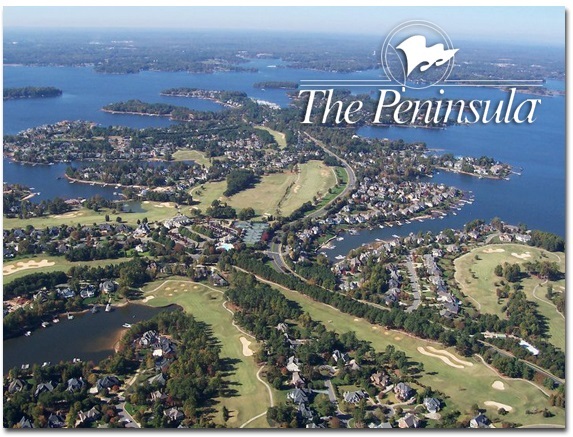 And there are many to choose from—including The Peninsula, a wonderful country club community in Cornelius. What do you need to know about The Peninsula? Start with the club itself, which is exquisite, and includes a number of opportunities for family fun and recreation. There’s a fitness center here, and places to go swimming. There’s a beautiful and ingeniously designed golf course, and there are also facilities for parties, weddings, and other events. Even if you’re not into country club life, however, this community has much to offer. The homes here are large, most of them situated on expansive lots. They provide a sense of seclusion and retreat, but also easy access to the club and to other perks in the Cornelius area. And there are plenty of non-club things to see and do around town; Lake Norman is not far off, and the big City of Charlotte is just a quick drive down the road! Cornelius families are zoned for Charlotte-Mecklenburg County Schools, one of the top districts in the entire state. There are a number of private school options, too. Lake Norman is just down the road, and offers plenty of opportunities for maritime fun. There are also a number of close-by shopping opportunities, NASCAR events, and more. The bottom line for those looking to settle in North Carolina is that Cornelius has endless charm—and a ton of great neighborhoods to choose from. The Peninsula is one of the very best. Come tour some homes here today. Contact the Minges Cline team to set up an appointment.